We can’t believe it!! 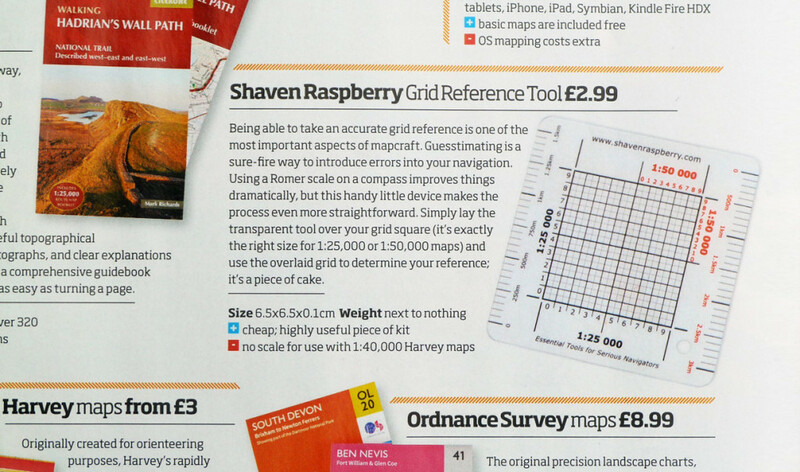 The Shaven Raspberry Grid Reference Tool has just been listed in the 2016 edition of Trail Magazine’s Gear Guide! The Shaven Raspberry Grid Reference Tool which was designed and made by us takes the guess work out of grid references, and allows you to accurately give and plot 6 and 8 figure grid references with confidence. The ruler scales on the sides are graduated in distance for both 1:50 000 and 1:25 000 maps and allows you to accurately measure travel distance with no fussy calculations. Having the Shaven Raspberry Grid Reference Tool listed in the Trail Magazine Gear Guide demonstrates that the guys and girls at Trail really think that it’s a neat piece of kit that helps with the elimination of navigational errors and contributes to improved navigational accuracy in an easy and straightforward way. Thanks guys, we appreciate your support!